Here is another of my NaNoWriMo creative companions. 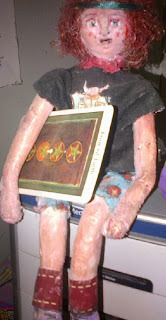 This doll was made by my partner a couple of years ago and holds an important Tarot card. It's hard to see in this picture, but Serena even made the doll a cute NaNoWriMo t-shirt with the Office of Letters and Light logo. On Sunday it rained and on Monday the wind blew. It now feels more like fall; like the end of October. Don't get me wrong! I loved the warm and unusually calm fall days we've had. But I did feel a bit of relief when I woke up to wet tires on the pavement, rain hitting the window, and a tree branch stroking the roof. It was probably the wind knocking over a loose board on the fence and tipping over the empty watering can on the porch which caused disruption in my dream; and that was okay. The wet sloshing sounded familiar and my blanket felt cozy as I tucked it up under my chin. I heard that Central Oregon got some snow today. As will Colorado tomorrow and I think somewhere in Montana they are expecting ten inches. I'm fine with the rain. Which cleared into a cool and crisp and still windy Monday. A nice day which felt like fall. Today I am meeting (even as I type) with my Tuesday writing partner for the first time in a few weeks, due to "life happens" events. It feels great to be back here with her, writing, talking about our goals, writing. And today I am already having a NaNoWriMo character rebellion. Only one, but it has already started. The short story character I wrote about earlier, who would be joining this cast for NaNo2013, said "no." Not even with a "thank you" added, she has declined the offer to be in the novel. Or perhaps it was the original character who convinced her that she needed to stay in her own story. The change has been made in my Scrivener character notes and I am underway finding out more information about the original character. The short story beach walker will linger in the wind and sand with her KFC and girlfriend, until I can get back to them.